The ‘Annual’ car kits (sometimes called ‘Yearly’) produced by AMT have been mentioned a few times before in SMN. 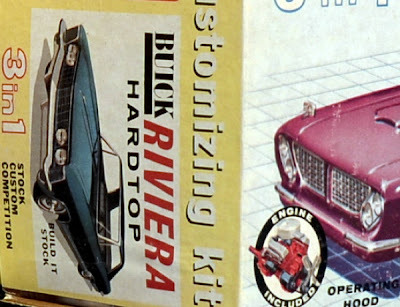 The Annuals featured the latest cars released by full-size auto companies which AMT, Jo-Han and MPC, and to a certain extent Revell, then matched in model-kit form. AMT started producing Annual kits in the late 1950s, though originally they were all packed in generic design one-for-all boxes, where the only indication of what kit lay inside was a label, sticker, or a small insert panel on the box-ends. Otherwise, the boxes looked identical. 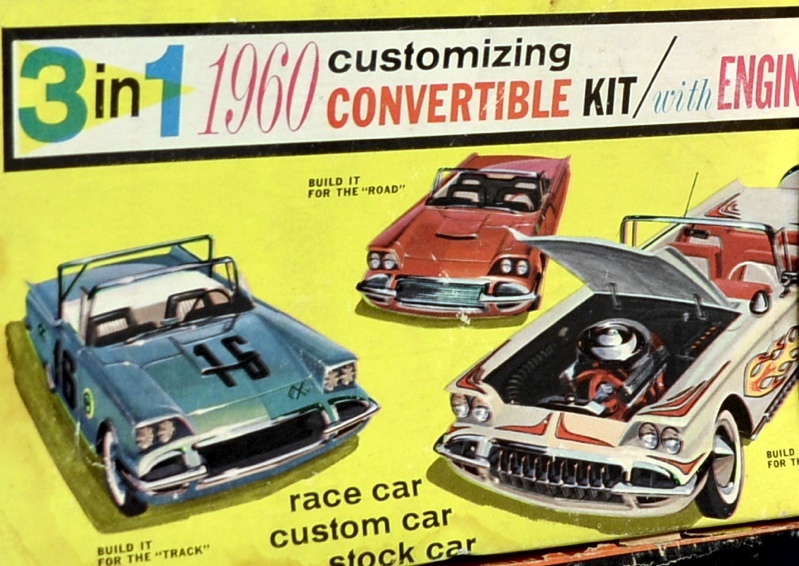 This generic approach stayed until 1963, and by then, although the box-top remained the same, at least each box-end was dedicated to a particular car. Then in 1964, individual box-art came in, although an overall style or theme for the particular year was retained. Here’s just an indication of the confusing box designs of early AMT Annual kits, shown by six examples, dating from 1959-1964. The boxes in the pic (below) start with 1959 at top left. 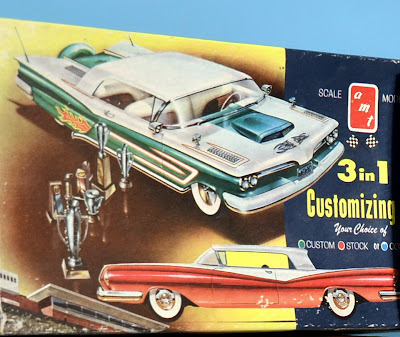 1959 - Kit identified only by a written name on the white stripe on the box-end, in this case a Lincoln Continental. 1960 - From the box art, this could be a Ford Thunderbird, but no, it’s a Chevrolet Corvette. A small printed sticker can just be seen on the lower edge of the box-end panel, gives away the identity. 1961 - Similar treatment, though the sticker (which also acts to seal the box), has been torn away. This is a Mercury Hardtop. 1962 - Has a small curved panel printed in black on the box-end and top. The model inside is a Ford Galaxie Convertible. 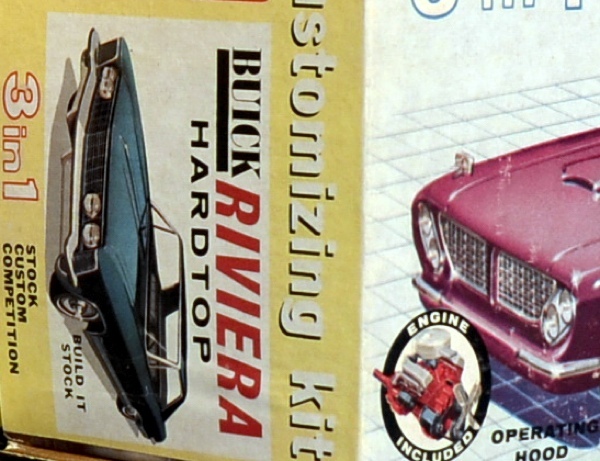 1963 - Here the box-end has a panel clearly depicting what’s inside, a Buick Riviera Hardtop. 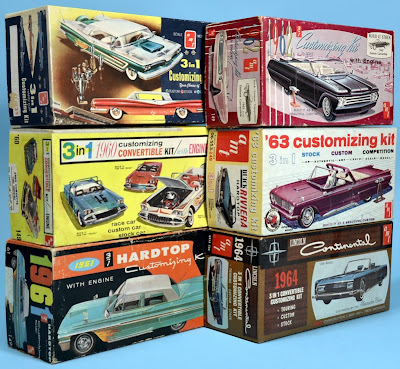 1964 - Only now is the whole of each box dedicated to a particular car, in this case a Lincoln Continental Convertible. Plenty of AMT car kits here.